In view of the extensive media coverage for big data, algorithms and artificial intelligence, it can seem as if computers and machines have become better at making decisions than people are. In ‘Sensemaking: The Power of the Humanities in the Age of the Algorithm’, philosopher, political scientist and consultant Christian Madsbjerg convincingly speaks out in defence of human intelligence. Madsbjerg argues that big data is focused on correlation rather than causality; it fails to answer the question ‘why?’. We still need humans to make sense of things. According to A.G. Lafley, former CEO of Procter & Gamble and author of an excellent book on strategy, studying the liberal arts and humanities enables managers to develop essential conceptual, creative and critical thinking skills. Madsbjerg differentiates between ‘thick data’ (data which includes context and meaning) and ‘thin data’ which is the big data used by computers and algorithms, and he illustrates the differences using very clear examples. The only thing lacking in this terrific book is a simple model visualizing Madsbjerg’s idea. That would make it crystal clear that human intuition and experience remain indispensable when utilizing big data and algorithms. 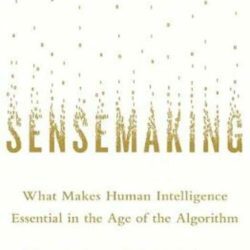 ‘Sensemaking: The Power of the Humanities in the Age of the Algorithm’ (2017), Christian Madsbjerg.